Miso Black Cod is one of my favorite dishes to order when I dine out. Once I started making it at home and realized how easy it was to prepare, I started cooking it regularly. Black Cod is fattier than regular cod and is a very soft fish. It also doesn’t have a strong fishy taste. I’ve prepared black cod a few different ways but this miso based marinated recipe compliments it the most and literally melts in your mouth! It’s best to marinate the fish overnight so it makes it an easy do-ahead meal. You can purchase the fish with the skins on or off. Either way, the skins will detach from the fish during the cooking process. You may not be familiar with some of the ingredients in this recipe, but once you try them, you may want to try these flavors in other dishes too. Whole Foods in Hillcrest almost always has local Black Cod in stock. I also use the Marukome All Natural Miso Paste and the Eden brand Mirin Rice Cooking Wine that I purchase from the same location. The Miso Paste is non-genetically modified and contains no additives and the Mirin doesn’t contain any of the high fructose syrups that some of the other brands contain. Be sure to look at the ingredients you buy as they may contain unnecessary added sugars. I use raw honey to add sweetness to the cod; you can also use sugar if you don’t have honey on-hand or prefer sugar instead. The same ingredient amount will work for both. In honor of Valentine’s Day this year, to compliment the flavors in the recipe I created a hearty red quinoa combination with sautéed mushrooms and currants. I’ve been enjoying this side with many other protein dishes and have even enjoyed it alone as a vegetarian option. I like to re-heat the leftovers in a pan with a little oil to create a crisp texture. To complete this dish and make it even more special, baby bok choy halves are lightly grilled on a skillet in minutes. You will feel like you are at a 5 star restaurant with this elegant and tasty dish! In a small saucepan, bring mirin and sake to a boil. Add miso and whisk until dissolved then whisk in the honey and remove from heat. Pour into a large glass Pyrex to cool. Once cooled, place black cod fillets flesh side down, cover and refrigerate overnight. Place rack in upper 3rd of oven and set to broil. Lightly brush baking pan with oil, remove fillets from marinade and place fillets flesh side up side by side. Sprinkle with black pepper and broil until golden and flaky, about 12-15 minutes. While fish is cooking, heat oil in a medium to large skillet on medium-high heat. Sprinkle bok choy with salt and pepper and cook cut side down until lightly browned, about 2 minutes. Flip to other side and continue to cook until slightly tender, about 2 minutes longer. 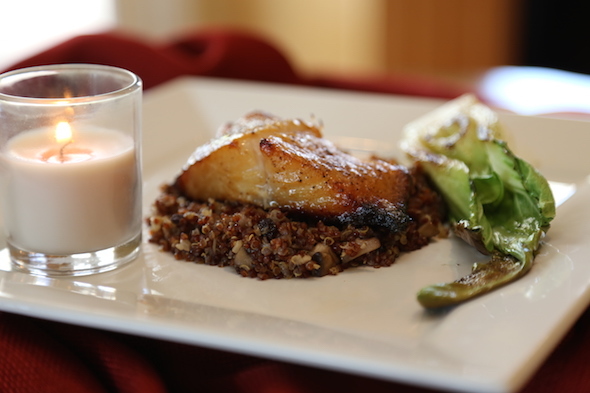 Serve fish over red quinoa and a side of bok choy.